I like them all,but would choose #4. #1 is a keeper for sure!! I'm now officially a follower and I promptly have you at the top of my blog for all to see! Happy Holidays! You've inspired me today! I like #1, with the rickrack! I like the #3 topper with the tassles..I want to make one!! #2 is my favorite! The dark border just makes those colors pop! I would love to win. Thanks for the great giveaway. These are sooo cute! 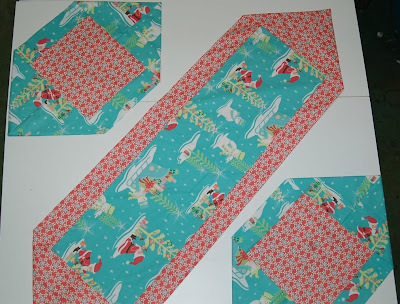 I think Table Topper 3 is my favorite...and I'm wondering how many I can make before Christmas!!! What a fun giveaway! I love them all, but my favorite has to be the one with the rickrack! I am mentioning this on my blog and following on Google Reader! I like table topper #3 the best. All of your work is lovely! Thanks for the great giveaway! All 3 are very cute, but #3 is my favorite. I love the green center panel, and the back says 'party!'. I love the second and the frist a lot. The second one would match my house a lot better! I have now become a follower and I can't to check out the blog! I love finding fellow Utah bloggers! I vote for #3, especially the back. thanks for the chance to win. I have posted about your wonderful giveaway! I love number 3. It's fantastic! I love the one with the ric rack best!!!! It's just too cute <3! I like Tabletopper 3. Love rick rack. Thanks so much. I know it was more work, but I really like number 3. I just would not be able to decide what side to use. :) They both look like candy. I like table topper no 1 best. But they are all lovely! Thanks for the chance to win! I love the rick rack one, but I think the third one with the tassels would be my favorite. They sound so easy to make too. I love number 1! Though 3 is really up there too! I think I like number 3 the best. I love the big ric rac! I like the back of number three the best, but they're all cute. So hard to pick but I think I'm going with #3, although I love the simpler lines of #2 also. The one with the ric rack is my favorite. I think I will whip up a few to have on hand as extra gifts,. I love #2!! Thanks for the giveaway! My favorite is the snowman runner that has a black star border. They are all very cute! I have to pick #3 but they are all wonderful!! I have happily joined as a follower. I like #3 best, it's the most vivid, cheerfull, and goes with some of my other decorations. plus I love the tassle ends. Love the tassels on the third one! Thanks for the link to the table toppers. I like the last one the best...particularly the backside! How cool. Thanks for the chance to win. I like the back of #3. Thanks for the chance! What great table toppers!! I like #1 the best. The rick rack is wonderful. I like table topper #3 - it's fun! 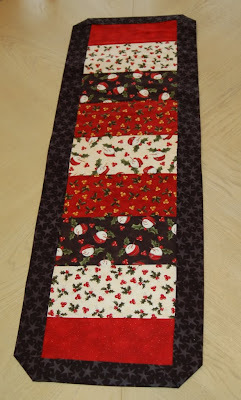 I love table topper #3.... you have some gorgeous patterns! I've been ogling your blog for the last hour! TABLE TOPPER ONE!!! !, it's lovely with the rick rack, I also love the "effect" of the third!, please enter me! I'm your follower!!! !, I'm going to blog about it, in a little bit! I am a follower so you can add my name once for that. 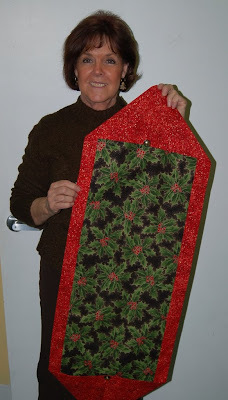 I like tabletopper #2, I like the darker fabrics! I just became a follower too!! No. 3 has my vote. I love all the colors, and the tassels. All the tabl toppers are pretty. I like #3 the best. I love the table topper nr 3. 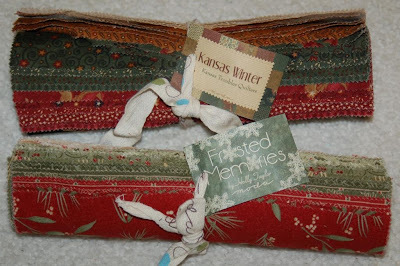 And I like the Fristed Memories fabrics :o) There is an link to your Giveaway at the side bare on my blog. Tablerunner # 3 is my favourite, but I like them all..
My vote goes to number 2. Love Table Topper #3 with the tassels and of course the matching placemats. Will need to make a few of these for Christmas!! NOW TO GET BUSY SEWING!! Me gusta el numero 3, el detalle de las borlas y el interior. I like table topper 1 but I also like 3. I really like the ric rack on the toppers. I like the table topper No. 3 becauce it is so different and the colours makes me happy. These fabrics are fantastic. Love all these tabletoppers, but I must say that the one with the tassles is my fav! I have made that topper in Christmas fabs for my daughter last year. It is so easy and looks great. I am also now going to follow your blog, it is great. I like them ALL--but maybe the 3rd one the best. Great colors! WOW...it's really hard to choose but I think I'll go for #3 because I love the tassels! Perfect for gifts!! Great giveaway! Table topper #3 is my choice. Thanks for the chance to win! My favorite is 1, with the ric rack going down the sides. I LOVE it! Great blog! I've just become a follower. 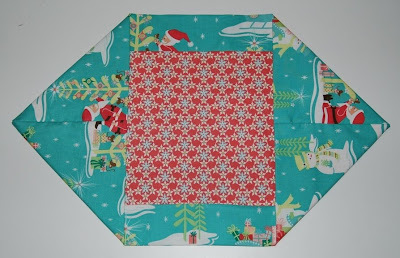 Table topper 2 is my favourite - I love the darker border to highlight the bright Christmas colours! Table Topper 3 is my favorite, although I really like them all. I love what you did with the ric rac and tassels. #3 is my favourite. Thanks for the great giveaway. I think #3 table topper is my favorite!! the colors are so vibrant and love the tassels.. Can't wait to make one. ...table topper 3 is the favourite. They looked like fun to make! I love Table Topper #2. I just love those colors! Thanks for the great giveaway! Oh drat! I forgot to add... I'm now a follower as well! I really like #1 and #3, but I'd have to say my favorite is #3! Thanks for a great giveaway. I like the number one, because of the ric-rac. Good morning, I love table topper #3. It is bright and cheery. I have also become a follower. 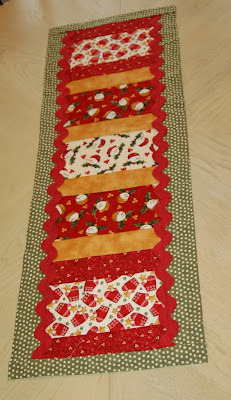 Table topper #3 :-) I'm also a follower and I'll post about it on my blogg. Wishing you a great Christmastime. I like #3, great colors! Thanks Sharon. Table topper number three is my favorite! It's cheerful and warm and the ric rac is a wonderful touch. 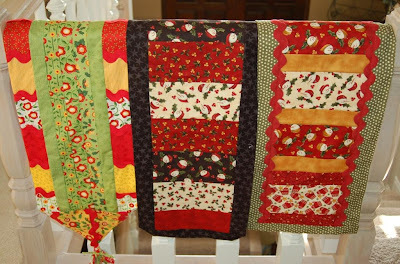 I love the first table topper with the rickrack. I have never used the large rickrack in a project, but it always looks so good! Thanks for the pictures and the inspiration! I found you on Quilt Hollow. 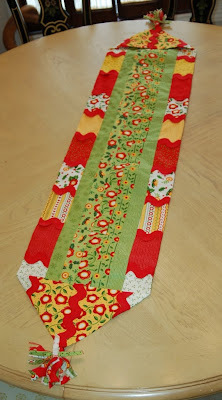 Quilt Hollow pointed me here...I love tabletoppers and your ideas are fantastic! Especially #3, my favorite one. I am going to post on my blog now and will come back with the link :) What a nice giveaway! The #2 is my fave! I really like those colors together. #3 is my fav but they're all wonderful! I can't choose - I like them all. Quilt Hollow sent me here and I would love to win. I like #2. But they are all pretty. I will have to try it. 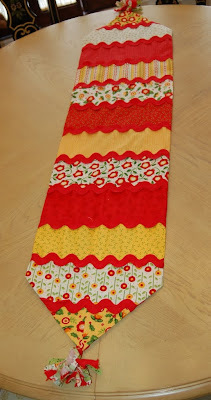 hi, I came from quilt hollow and I love them all but if I had a pick #3 very bright and fun! Thank you for this chance. I am also having a giveaway, stop over! I am really lovin Topper No. 3. Thanks for the great photos! I am now not only a follower, but subscribed to your blog on my feed list. Thanks for the great info and tute! I think (hmmmm) table topper nr.3. Thank you for sherring the way too sew it. Table topper #3 is my favorite. I love the colors and the design of it. I like # 3, love that both sides look like a front! Thanks! I'll have to vote #3! For some reason it reminds me of candy?! Thanks for the chance to win! I'm in Logan so the next time I go to SLC I'll have to stop at Heritage Fabrics on the way! I love all of the table toppers. I think my favorite is #3 because it's reversible and you can get twice the milage out of it. Hard to choose, because all table runners are beautyfull, but I think my favorite is number 1. I become your follower so will visit you frequently now on. Topper #2 is my favourite. Beautiful giveaway. Thanks for the chance. I like number 3, Love the ric rac on the back.